Conservatives are often pegged as more racist than liberals. This claim is consistent with research from a number of disciplines, labs, and methodologies. My academic grandfather, David Sears, popularized the idea of “symbolic racism”, a form of racism that is a melding of traditional (i.e. conservative) American values and negative affect towards Blacks (pdf) (and I’d argue the acceptance of inequality [pdf]). Measures of symbolic racism are related to everything from opposition to policies explicitly likely to benefit Blacks, like affirmative action (pdf), to less explicitly racial policies, like policies regarding the inner-city (pdf) and gun-control (html). People who score high on the symbolic racism scale tend to support the conservative side of many of these issues and also tend to vote for conservative political candidates (pdf). An important question is why conservatives look more racist than liberals. There are two dominant explanations. 1. Conservatives, psychologically, are less open to new experiences, diverse people, places, and things (i.e. nouns) (pdf). They also prefer strict categorization and structure (pdf), have moral values that value ingroups over outgroups (pdf), and have a circumscribed empathic circle (pdf). Liberals, on the other hand, are just the opposite. They value new experience, diverse people, places, and things (i.e. nouns). They are open to many shades of gray, have moral values that value fairness and justice, and have a much wider moral circle. By and large these relationships are backed up with large (and often representative) samples, using up-to-date measures, and replication across labs and studies. In short, these relationships appear to be robust and seem to predispose conservatives to racism and liberals to tolerance (pdf1 pdf2). 2. Conservatives and liberals both dislike and are intolerant of people with different ideological values and beliefs. Like other types of group conflict, the group conflict between liberals and conservatives creates animosity on both sides of the political spectrum. Conservatives dislike liberals, liberal-related groups (e.g., Democrats, Unions), and groups perceived to be liberals (e.g., poor people). To the same degree, Liberals dislike conservatives, conservative-related groups (e.g., Republicans, Tea Party), and groups perceived to be conservatives (e.g., Evangelical Christians) (pdf1 gated1 gated2). One group that is often perceived to hold onto a liberal worldview is Blacks. For this perspective – what we’ve dubbed as the ideological conflict hypothesis (pdf) – conservatives dislike for Blacks comes from the perceived ideological conflict and not necessarily the psychological closed-mindedness of conservatives. Two recent papers have the data to help pit these two hypotheses against one another. The first two studies by John Chambers and his collaborators (gated) used both a within and a between-subject design. Rather than ask participants about Blacks and Whites, the researchers asked participants about liberal or conservative Blacks and liberal or conservative Whites. In both cases, replicating normal finding, liberal participants liked liberal Blacks more than conservative participants; however, liberal participants disliked conservative Blacks compared to conservative participants. There was no effect of target race and there was no interaction between target ideology and race. Ideology trumped race. There are a variety of reasons people may be skeptical of the simple like/dislike measure used by Chambers and his collaborators. 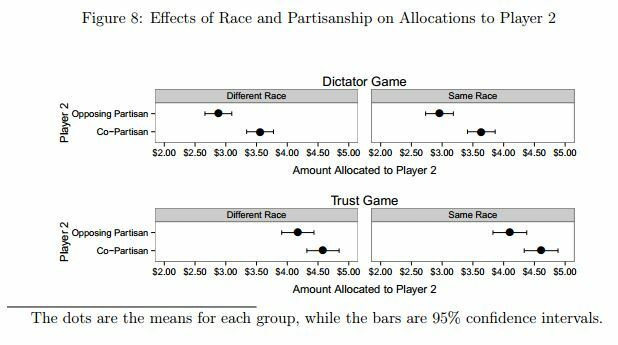 Luckily, political scientists also ran some very very similar studies, but also included measures of behavior, the trust game and the dictator game (pdf). Participants’ partners were described as being Republican or Democrats and as being White or Black. Replicating Chambers’ results, Democrats and Republicans were both more generous and more trusting with ideological ingroups than outgroups; however, the race of the participants’ partner had no significant effect. There was no effect of target race and there was no interaction between target ideology and race. Ideology trumped race. So, what can we conclude? Are conservatives racist because they are predisposed to favor ingroups, shun openness, and have strict categories? I don’t think so. Such an explanation predicts effects of race and an interaction between race and ideology. Instead, in studies with large samples, diverse methods, and from labs working independently  the effects of ideology trump any impact of race. People do not appear to like – and perhaps even actively dislike and derogate (see the last study of the Iyengar and Westwood paper) – people with different worldviews. When race does not serve as a heuristic for a different worldview, the “conservatives are racists” effect disappears. Some people don’t like the measure of symbolic racism because it explicitly confounds conservative values (gated) (though, as you might imagine, symbolic racism researchers disagree [gated]). The same basic association – conservatives responding with more racism – occurs on a variety of different measures of racism (pdf). Perhaps more. Please share. Competing hypotheses are the best. Maybe we can test them together? Some of these relationships are larger than others. A reasonable heuristic is that constructs with less value content (e.g. personality traits) have smaller effect sizes than constructs with more value content (e.g. moral values). And for good reason. On average, the group votes for Democratic candidates at a very high rate. This is actually a bit of a problem since the latter of those papers would have ideally benefited from the insights of the earlier papers. Political scientists and psychologists should talk a bit more. Whether this somehow gives people a moral license to express racist views etc is a different story entirely. -I made a couple of quick and small edits after originally posting this, but before I think anyone read it.